Gardeners encounter many instances when they need to cut a tree branch. Generally, it will be for the health of the tree, to improve its usefulness in the landscape or to relieve a dangerous situation. An essential step in the process is to choose a tool that is appropriate for the job and that you can operate comfortably and confidently. Anvil pruners are cutters that fit in your hand. While the cutting edge of the pruners is open, slide the tree branch between the blade and the anvil or block that is opposite the blade. Squeeze the handle to force the blade through the branch to the anvil. You can avoid creating jagged edges on your branches if you keep your blade sharp and apply sufficient pressure when squeezing the handles. Anvil pruners differ from bypass or scissor action pruners because anvil pruners have only one sharp blade. Manufacturers produce lopping shears with several different features designed to increase the gardener’s comfort and make it easier for the gardener to control the loppers. You can find blades in the anvil and bypass styles. Lopping shears have larger cutting surfaces than typical handheld pruners. Lopping shears have long handles, up to 30 inches. The user holds one handle in each hand; while in the open position, the user places the cutting edge around the branch and brings the handles together to the closed position. 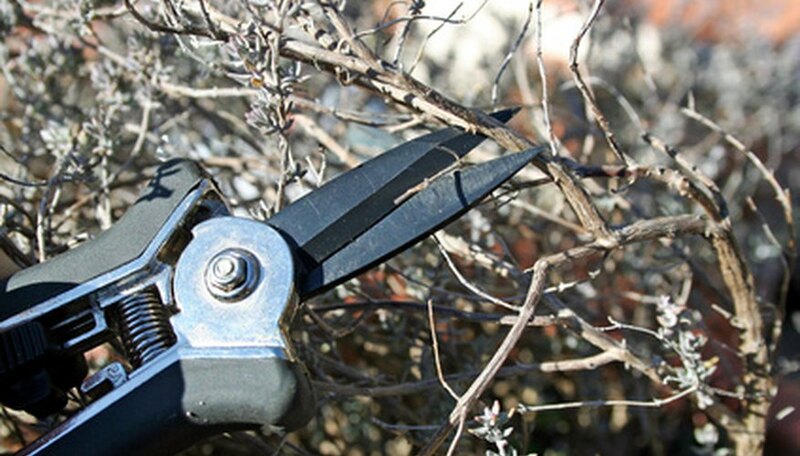 Use lopping shears to cut branches up to 2 inches thick. Cushioned grips will reduce fatigue when you have to cut several branches in one session. Chainsaws have a gas or electric motor that moves a chain attached to a jagged blade. Exercise extreme caution any time you operate a chain saw. Use chainsaws for large branches and for branches that you need to cut quickly. Consider hiring a professional if you need to use a chainsaw for branches that you cannot reach while standing on the ground. Investigate the safety features for your chainsaw before you begin cutting limbs. Pole pruners and pole saws are modified cutters that allow you to reach high branches from the ground without climbing a ladder. Pole pruners are similar to loppers, but they incorporate an extension pole that you operate by pulling a rope. Pole saws use a saw blade to perform the cutting action. Pole saws use sectional extensions or telescoping extensions to increase your reach up into the tree.